I’m sporting a rather splotchy face and puffy, bloodshot eyes for the second time today. 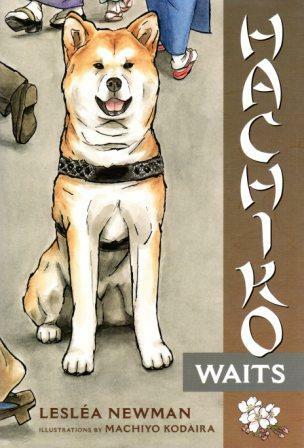 Should’ve known better than to read Hachiko Waits by Lesléa Newman and watch “Hachi: A Dog’s Tale” in the same day. I’m emotionally spent! In 1930s Japan, a professor named Ueno discovers a handsome Akita puppy at his neighborhood train station. Naming him Hachi (after his lucky number, eight), Ueno takes him home and cares for him up until his death, which happens quite suddenly. Hachi begins a ritual of accompanying his “master” (I prefer the term “guardian”) to and from the Shibuya station every day. When Ueno disembarks from the train car, Hachi is lovingly there, awaiting him. Despite Ueno’s passing, Hachi continues this vigil for nearly a decade until he himself passes away, under the care of a man named Yasuo. This is such a moving story and I recommend both the children’s novel by Lesléa Newman and the film produced by and starring Richard Gere. Whereas Gere and his cohorts have Americanized the narrative, Ms. Newman stays true its Japanese spirit…at least in my humble opinion. (I took a few semesters of Japanese, backpacked across Nippon and have my own Japanese family of sorts.) I can picture kimono-clad Ueno and Hachi sharing a bowl of rice or miso soup in the morning while sitting on their tatami mats. And the formal conversational exchange occurring between the higher ranked professor and the lower stature station master. Beyond her classic depictions of societal life in Japan, Ms. Newman nails the inspirational nature of the story. All of Japan was enthralled with Hachi, so much that the papers bestowed upon him the respected name of Chuken Hachiko (faithful dog Hachiko). They also raised a commendable amount of funding to build a shelter and provide food for the canine. And when he left this world, the Japanese people erected a statue in his memory which can still be seen today at the Shibuya station. The statue also features prominently in Newman’s book as the young Yasuo, Hachi’s caretaker after Ueno’s death, meets his future wife there. He helps to liven up what can be a very touching, yet sob-inducing story. As for aesthetics, Machiyo Kodaira’s black & white illustrations are not only beautiful, but they help break up this chapter book into manageable chunks for younger readers.